Ouarzazate stands strategically between Marrakech and Merzouga in Erg Chebbi Dunes, the best part of the Moroccan Sahara Desert. Without a doubt the best option to travel between Ouarzazate and Merzouga (village in Sahara Desert on the bottom of Erg Chebbi Dunes) is the new bus service of Supratours company with a daily bus from Ouarzazate to Merzouga. 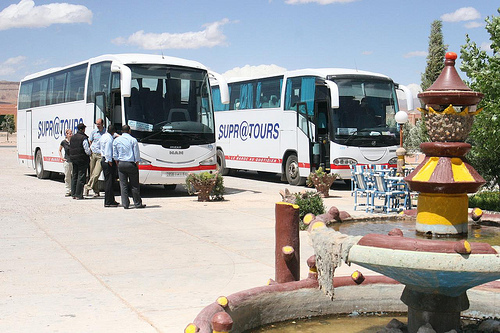 The Supratour Bus connecting the city of Marrakech and the Sahara Desert is the same bus making the Marrakech to Ouarzazate route. The trip with the bus Ouarzazate Merzouga is a fantastic trip where you’ll pass the Rose Valley and towns like Kalaat M’Gouna, Boumalne Dades, Tinghir, Goulmima, Errachidia, Erfoud, Rissani and finally the finally destination of Merzouga. ONCF & SUPRATOURS Official Website.